Welcome to Vilnius Bike Tours and Rental! 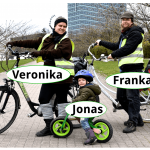 Velo-City Vilnius is a small family business making it’s living from bicycle rental and city tours by bicycle in Vilnius and around. City tour by bicycle . We are convinced cyclists and support the development of a bicycle culture in daily life. first two weeks of April: 11 a.m. to 5 p.m.
start at daily at 11 a.m.
About exceptions from the rule we inform in our news (see below).